A while ago we posted an article concerning Patent#US 6883462: The Doggie Poop Freeze Wand. While freezing poop is somewhat odd to me (though I did find out the reason while researching this article), the notion of doing so has resulted in a commercial product that, while differing in design from the Freeze Wand, essentially performs the same feat: Poop Freeze. The point of Poop Freeze is not to make popsicles to use a a nasty April Fool's Day trick on your roommate; even I'm not that evil. What this stuff does is exactly what the title says: freezes dog poop. This makes the mess easier to pick up and cuts down on the amount of time needed to clean a stained area. The consensus of efficacy on this product is mixed, with the primary complaints revolving around how it does not solidify lose stools (yuck). It is also something of a small can, so if you have a Great Dane, I wish you luck. Customers that support the product really like it. But as mentioned above, the reviews are a mixed bag. But, the beauty of the reviews (particularly on Amazon) are the wording--which is poetic in a sick way. Phrases--such as "When my dog lays a loaf," "doggie tootsie rolls," and vivid descriptions of simply picking the poop up, putting it in a freezer bag, then freezing it--abound. This last begs the question of why you would ever put poop in the freezer to begin with... I simply don't understand that. From what I can gather, Poop Freeze doesn't quite "freeze" poop, so much as it takes that moist, steamy edge off of it--making it less offensive to clean. So it appears to work... in a sense. 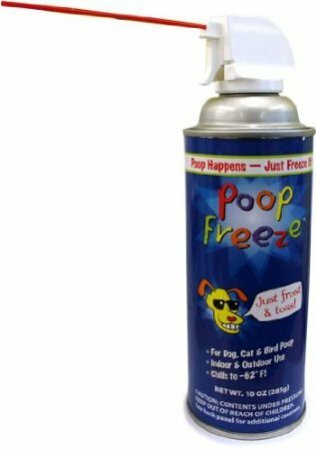 To find out more about Poop Freeze and it's fellow products (Dog Fart Terminator, anyone? ), go here.